Arrive in Yangon and transfer to hotel. Yangon, formerly known as Rangoon, is still a relatively quite and charming city. Its impressive colonial and spiritual heritage makes Yangon one of the most fascinating and authentic capitals of South-East Asia. After lunch, a city tour includes Kyaukhtatgyi Pagoda’s 70m long reclining Bouddha, downtown Yangon with its faded colonial atmosphere, and then visit Shwedagon Pagoda. After visiting Shwedagon Pagoda, a wonderful dinner invitation awaits you at Karaweik Palace- a restaurant located on the Royal Lake where you can also enjoy traditional dance show. Overnight in Yangon. After breakfast at the hotel transfer to Yangon International Airport for the flight to Bagan. Thousands of ancient stupas and temples in this area make Bagan, one of the most remarkable archaeological sites in Asia. From the 11th till 13th century, when Bagan was the capital of Myanmar, the rulers of constructed huge stupas and temples, many of which are still standing today on the banks of the Ayeyarwaddy river. 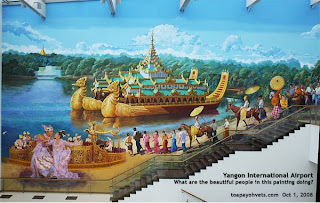 On the arrival, morning sightseeing features the colorful Nyaung Oo market , the Shwezigon Pagoda and its magnificent golden stupa, Wetgyi-In Gubyaukgyi, a cave temple with exquisite jatakas murals paintings and the elegant Htilominlo temple noted for its fine plaster carvings and glazes sandstone decorations. Lunch at one of the river view restaurant. After lunch, observe the process of traditional lacquerware, one of the best-known Myanmar handicrafts and speciality of Bagan. After that visit Ananda temple, an architectural masterpiece of the early-style temple with two original standing Bouddha images whose facial exprerssion change depanding on the distance the statue is viewed from. After that stroll around one of the typical village Pwa Saw and enjoy the village life. At the end of the day with a horse cart, touring among Thanugbi village, Sulamani Temple and the massive Dhammayangyi noted for its remarkable brickwork. Enjoy the sunset over the site from one of the temple. Return to hotel. In the evening a moonlit longyi party held with a traditional puppet performance. Overnight in Bagan. Option : Longyi Party for longyi – 10USD per person, during the dinner, every participant can take photo with traditional dress, and all the photo will be presented to the groups upon departure day.USD 200 per group. After breakfast at the hotel transfer to Nyaung Oo Airport for the flight to Heho. From Heho, enjoy a scenic drive to Nyaung Shwe, the gateway to InleLake, one of Myanmar’s Best known sights. On arrival at Nyaung Shwe village, proceed to the jetty and transfer by motor boat to the hotel situated in the lake. Lunch at Nanpam.An afternoon sightseeing tour by boat includes the chance to see the leg-rowing fishermen and the floating gardens, built up from strips of water hyacinth and mud and anchored to the bottom with bamboo poles. The tour also includes a visit to Paung Daw Oo Pagoda, the weaving village of Inpawkhon and the newly opened ara In Dein. Return the hotel in the late afternoon. Dinner at your hotel and enjoy your evening by lakeside . Overnight at Inle Lake. After breakfast, visit a local market to observe the many difference minority coming down from their mountain villages to sell their goods. And then transfer to the airport to Yangon. Arriving to Yangon around 12 noon and lunch at Kandawgyi park. After that transfer back to the airport to Singapore. < Upon arrival from Heho, our company staff will make a pre-check in for the group. Tariff period between 1 October 2009 – 31 March 2010. During Christmas and New Year Eve, there is compulsory gala dinner which we will advise one month a head of the season. For every 15 paying pax (15+1 ), 1 pax F.O.C on half twin basic.